Full Price: $ 200.00 8% off! 2012 16 In. Tonner Just Right Cami Fashion Doll, No. T12CJDD01 has long rooted strawberry blonde with gold streak saran hair, painted brown eyes with painted lashes and features, deep red lipstick, multiple joints for posing, and cameo skin tone. She shares the same high quality hard plastic and vinyl body type as Antoinette and Jon with the higher arched feet. Her ankles, wrists, and knees are jointed. 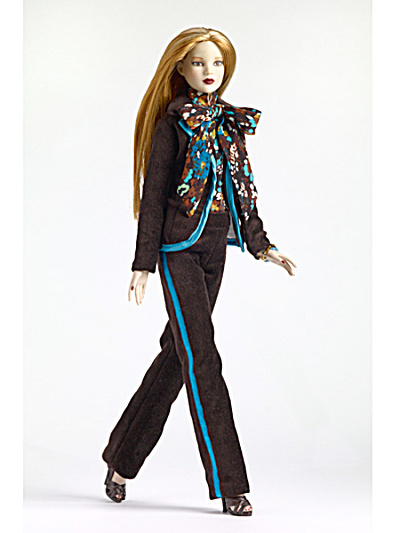 She is dressed in a brown velvet blazer with lining and turquoise trim, brown/turquoise print silk bow blouse bodysuit, brown velvet pants, brown imitation leather high heel strappy sandals, and a brown and turquoise bead bracelet. She can share clothes, shoes, and accessories with Antoinette. New and mint in box, with a stand. Limited edition of 500. Expand listing to view both photographs.